The Promax is a combi gas boiler. It is a condensing wall mounted model made and manufactured by Potterton. 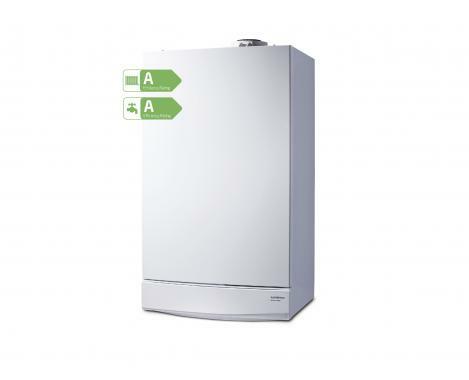 It is a highly reliable and fully modulating boiler, helping to save up to 73% of gas when installed with a gas saver flue gas heat recovery unit. This boiler comes with a wide variety of options and features such as a flueing option of up to 20m. It also features a built in frost protection helping to keep your boiler protected through those cold wintery days when you need your boiler most. This is a versatile and reliable boiler and it can be installed in a wide range of homes, such as small, medium or large properties. This unit also has a range of kW options such as the 24kW, 28kW and 33kW. It has an efficiency rating of 89%, making it a B rated boiler. It also has the best N0x class of 5. This unit features a robust hydraulic connection, helping to add to the boilers quality and reliability. This unit features a pre-plumbing jig helping to save time on the installation. It is a fully modulating and highly efficient boiler. This Promax boiler is able to intelligently use the right amount of fuel, helping to save you money on your energy bills. This unit comes with optional stand off bracket, helping to allow pipes to be routed behind the boiler, as well it coming with separate central heating and domestic hot water controls. It has 2 years warranty to add peace of mind that you have bought a reliable boiler.